Our entire selection of Brown cabinet colors can be viewed on www. eldstonecabinetry.com. Shown here on the Versailles door style in Cherry. Nutmeg is a Stain  nish. Shown here on the Pearlside door style in Cherry. Nutmeg with Chocolate glaze is a Stain with Glaze  nish. Shown here on the Wood eld door style in Cherry. Nutmeg with Ebony glaze is a Stain with Glaze  nish. Shown here on the Tremont door style in Alder. Nutmeg is a Stain  nish. Shown here on the Westburg door style in Oak. Nutmeg is a Stain  nish. Shown here on the Farmington door style in Hickory. Nutmeg is a Stain  nish. Shown here on the Monterey door style in Lyptus. 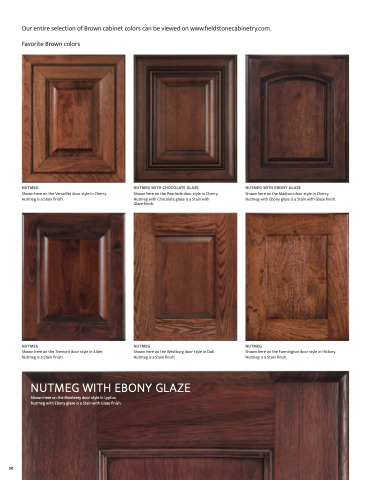 Nutmeg with Ebony glaze is a Stain with Glaze  nish.